Last summer I didn't get any bear photos...here's the bear I did see twice on my walks last fall...just never got a photo of her...I was too busy worrying about whether she was going to charge me (to eat me) or let me go. She let me go. She's spending a lot of time roaming the area. Lots of people are taking her picture. My husband says she's an old lady. ..a scrawny old lady. My neighbor had her in his yard and when she headed to our yard he called. Thank goodness Kinley was inside. I forgot about this photo from at least two weeks ago. Lots of moose around also. This was taken across the street from my house. And I also tackled another scrap project I've been meaning to finish for about eight years...really!!! I even took it to Paris but all I got done there was trimming all of the half square triangles. There are a ton of HSTs that I would like to turn into pillow shams to use with the large quilt the HST's came from....it's a quilt I use regularly on our bed. These pinwheels will finish at 5 1/2-inches. I have forty to make with the scraps I have...then I will have to figure out the settings and borders. I think little projects take just as long as king-sized quilts when it comes to figuring out what to do. Of course the quilting we be nice and quick. McKinley turns a year old in just a few more days. Notice the bear bell on her collar...rather important lately! The best part of being back in Alaska is having a dog. I reallllllllly missed having a dog for three years. Last night about 10 o'clock, my neighbor took this photo from her deck. I believe I have encountered this bear before...last fall. It was very scary but he was not aggressive toward me at all. I knew he was back in the hood...he had been spotted several times by others the last few weeks. Neighbors across the street have a trail cam that captured these shots. Sure hope this is the same bear and there aren't two of these hanging around!!! And check this out...a Black Bear Festival!!! The street I live on is called Bear Ridge Circle...very appropriate name. I wore a gun strapped to my hip yesterday the entire hour I spent working around my yard. I'm trying very hard to get used to having it with me. In the meantime...I will try and get some quilting done between bear sightings. I have a very complicated BOM I want to quilt this month. I have struggled for many years to get the hang of using my machine. I barely touched it the first two years I owned it. Then I got motivated. I called the manufacturer and they recommended some DVDs made for my machine...it was just what I needed to get going. There is so much to learn and it is so expensive: thread, bobbin winder, templates, pre-wound bobbins, machine needles, batting, marking pens....it all adds up and is different stuff than you use with your domestic sewing machine. 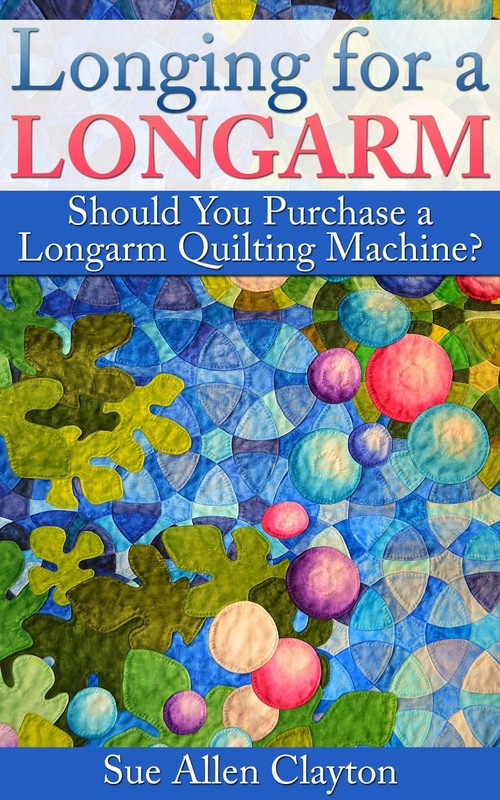 Handling an longarm is a physically demanding job. You are standing the whole time. Bending over when pinning the layers to the frame. Often guiding the machine with one hand while the other holds a template. It ain't so easy!!! And the most challenging part is figuring out what design to stitch. At one point I considered selling my midarm and just paying for someone else to quilt my tops. I'm glad I kept working through all my issues. It has been eight years and just one year ago I made a big leap in my knowledge and ability...which for me came from experience. 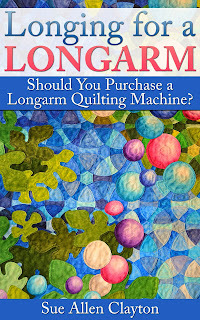 Of course there were many obstacles in my life that kept me away from quilting for several months at a time...and just like the book pointed out...it isn't like riding a bicycle. Next is a fabric organizing tip I got from our Breakfast Club leader, Marcia. Here's one of my fabric cubes. I try to fold the yardage the same size but as you can see...I'm a bit off! So simple...can't believe I didn't think of this. Use an acrylic ruler to wrap the fabric around...just like fabric companies wind it onto a bolt. The same cube with my re-folded pieces...I had trouble fitting 3 of the pieces back in but I'm thinking maybe the stacks will settle down and I can fit them in later. It took me 40 minutes to refold the fabrics in this cube. I didn't need to re-iron so it could have been worse I suppose. It will take me some time to get to my entire stash but it will be worth it. Fabric pieces must be at least a yard in length to make the cube The bonus...getting a new look at my fabrics. Lots of good stuff here! I've got my afternoon coffee and cookies ready as I put this post together. Hope you enjoy! First...a few miscellaneous projects. Two runners that were supposed to be "quilt-as-you-go." The technique in this case was just too bulky were the smaller sections converged. Rhona is our resident "pattern tester." If she says it didn't work...it didn't! Super-quick runner that is perfect for those special themed fabrics. Two of the ladies brought in their January mystery quilts. This was Gail's first time sharing a completed top from one of our Breakfast Club patterns. She added side panels of fabric for drops on a queen bed. Here's Norma's mystery back from the quilters...bound and ready to go! March's Breakfast Club (BC) pattern, Hunter's Star. I think this fabric line is called Black Tie Affair. Very elegant. Look at this...Gail's second BC project for show and tell...she's on a roll! I have to share one more bit of history I have with Gail. Her daughter adopted my Bernese Mountain Dogs when we moved to Paris. I met her years ago in Breakfast Club...then she stopped coming for a while. I met her daughter at my vet because she is a vet tech. Funny how things work out sometimes! Gail and I are back to attending BC regularly. Jenny and Tonks are doing great....though Jenny did have a recent cancer scare but doing well right now. Kathy's Hunter's Star is ready for quilting. She changed the number of blocks on hers...I think everyone did! Barb's Hunter's Star is in the same Bali layer cake that I used. So fun to see it with her awesome pink background. This is what I love most about BC projects....seeing everyone else's interpretation with their fabric choices and pattern changes! And my version. I pulled 10 layer cakes from this colorway out of the mix because they were too light to work with my background. Barb used a lot of those in her top since she had the darker background. I also had a set of the 2 1/2 strips in this colorway...Seaholly. I knew from the start I was going to do this border. Love it! Hunter's Star was on my bucket list so it is great this was a BC project. And April's BC pattern, " Himalayan Pink." Uses a 60-degree ruler. This is Joyce's version that she finished in class. She had it to the point of laying it out when class started. Which is where I am at now with mine. My cookies and coffee are done...ready to tackle that layout on the design wall.